Happy Halloween everyone! I wish you lots of treats without the tricks this holiday weekend. Of course, this means that tomorrow is the first of November – which means that Thanksgiving is less than a month away – which means that 24 hour holiday Carols will be playing on the radio and the countdown of shopping days until Christmas will commence. I truly love this time of year, but I wish that I could find a way to slow it down to a manageable pace. Those who know me well know that I am a very literal person. I tend to view the world in black and white with little gray variation. Sometimes this trait serves me well as I am very focused, goal-oriented, and follow directions to a T. I get the job done and do not create waves. However, there are many times when this diametric point of view is limiting. Here is one example. I have always enjoyed taking pictures of family and special events. Cameras, to me, are a way of capturing precious memories to be enjoyed over and over again. It never occurred to me that cameras can be a creative artform. I know – crazy. But that is the downside of my black and white brain. Camera’s function = memory saving device. Recently my eyes have been opened to many other uses for this versatile apparatus. One possibility is to use the camera as a diary. The website, 365 project, is a dedicated website for just that purpose. Take a photo a day (or more) to document your life in pictures. I have enjoyed following Amanda’s weekly photo posts this year and I think I might like to make this my New Year’s Resolution. There are several other photo blogs that I have enjoyed reading these past few weeks. Shutter Sisters posts a daily photo with a prompt. It is so interesting to see how others interpret the written prompt in a visual photo. Shutter Sisters also has a couple of Flickr groups (one word project and 365 days) to view all the photos which inspire lofty artistic dreams. Vision and Verb is a site that I recently came across which is touted as being a collaboration of women of a certain age. I find it comforting to know that many others do not discover their hidden talents until later in life. This gives me hope. Picture the Holidays is a photo centric daily guide to creatively and mindfully celebrating the season. With as much light and magic this time of year can bring, it’s easy to be equally hurried and harried. This 30-day (actually 31!) e-class is the perfect remedy for the holiday hustle. Seasonal photo prompts delivered to your inbox each morning will not only inspire your inner photographer but will encourage you to take a few moments to yourself each day to get creatively centered, one photo at a time. I think this sounds wonderful – and perhaps a great way to make myself slow down and truly enjoy the spirit of the season. Finally, I have come to realize that the creativity of photography is not just subject composition and camera settings, but it is also the manipulation of the “straight out of the camera shot” using photo editing software. This is what truly makes the picture an artistic endeavor. I have enjoyed the photo contest on the Pioneer Woman website recently (here is the first contest winners and here are those in consideration for the current contest). She uploads a raw image and then invites others to PhotoShop it any way they desire. I have been amazed – absolutely amazed – at the modifications one can do with a single photo. This has truly inspired me to make the time – and save the money – to take a course in PhotoShop. I have tried to watch a few online tutorials, but quite frankly, the lingo is a bit too technical for me to follow. I think for a visual learner such as myself, I need a hands on class where I can work on my pictures and have the opportunity for one-on-one assistance if needed. This was a rather slow week in the teaching arena – which is a nice change of pace. Of course, one of the reasons for this is that I lost my voice on Thursday night – which made teaching all day Friday a difficult task. Fortunately I had a few alternative lesson plans to call upon. English 1 students discussed the various themes of Fahrenheit 451 without much assistance from me. This was a great class as it showed the students that they can indeed work together and analyze a book on their own. I did have the DVD ready to play – just in case. The 7th grade class was scheduled to present their Tuck Everlasting projects – which meant that the students talked and I did not. I look forward to this particular lesson every year as it is so much fun to see the creativity of the students. My most favorite projects are the CD Soundtrack, where students must select 5 different songs to represent various scenes of the book (one student had such fun songs as Jail House Rock – when they are trying to help Mae escape from prison – and Forever Young – which is fairly self explanatory) and designing a game, where students must create a board or card game that is inspired by the novel. This year we had a chutes and ladders version of Tuck – a candy land version – and trivia pursuit. Students put a lot of effort in these projects and this class gives them the chance to show off. We spent the final thirty minutes of class listening to the Tuck music and playing the original games. It is a good way to end the week. It is now crunch time; T-minus one day and NaNoWriMo 2010 begins. I currently have about 16 students signed up for this challenge and that has me more excited that writing my own book. I had no idea that so many students would be thrilled about an academic endeavor. Some students have decided to have NoWri slumber parties so that they can stay up late and write together; some have created other worlds by drawing maps and buildings and characters. One senior has decided to take a required narrative paper from English Comp and develop it into a full length novel. His enthusiasm inspires me. I have downloaded the windows beta version of Scrivener and absolutely LOVE this program so far. I have decided that as much as I crave linear order in other facets of my life, writing comes to me in fragmented scenes. This program allows me to create index card scenes as I think of them; jot down little notes to refresh my memory for another time; and rearrange the digital note cards in any order I desire. What is especially useful is that the index cards are linked to the actual manuscript text which is also linked to an outline mode. This is quite valuable if I decide to rearrange my scenes, the text will also be rearranged in the proper order in the manuscript. Very cool, if you ask me. I now have a true incentive to complete the challenge as all winners of NaNoWriMo will be eligible to receive 50% off the retail price when it is released in January 2011. I currently have my character sketches – coupled with flickr photos for visual stimulation – and about 10-12 index card scenes. I hope to flesh out a few more scenes before the clock winds down and I actually have to start writing 1,667 words a day. It is a little scary — but also rather exciting. Reading was sacrificed this week in favor of teaching and writing. I do, however, have a few literary adventures planned for this upcoming week. Our county library is holding its Used Book Sale and Wednesday night is the special preview event for friends of the library. I have enjoyed going to the June sale for the past few years and I am anxious to see what bargains I can find at this first annual fall sale. I anticipate my personal reading to take a temporary nose dive in favor of writing this month, but I plan to start reading some holiday books once December arrives. I truly love this time of year and I want to schedule the time to savor each and every moment. I have purchased several holiday books throughout the year in anticipation of some focused reading during the hectic weeks of Thanksgiving through New Year’s. How about you? Do you set aside certain books to read at various time of the year? I love this daily photograph idea. I take loads of pictures when I travel and then all my cameras sit idle for weeks and months. But one photograph a day….I can come up with that. I do so love your weekly posts, Molly. You help to keep me centered. I am, you see, the complete opposite, which often results in swiftly tilting piles and last minute completions. I admire your organizational skills, Molly. I will be looking at the photo sites you mention here. Looks like some good ones. Thanks. I'm doing NaNo this year too! Good luck! I know it's going to be so much to participate when you have your class writing away with you. I absolutely love photography as a creative art form…which I've really come to know personally through my eldest son's work. He is a European photographer currently based in Berlin (after being in Prague, Ireland, England). We miss him, but now that he's on Facebook, we get to "see" him more. I love photographing things, but do not have his talent. Some classes might help. Wow, you're really organized with the NaNoWriMo…I have a few character sketches and scenes, but just enough to begin. I'll be filling in as I go along. I tend to follow my characters and "fly by the seat of my pants"…. 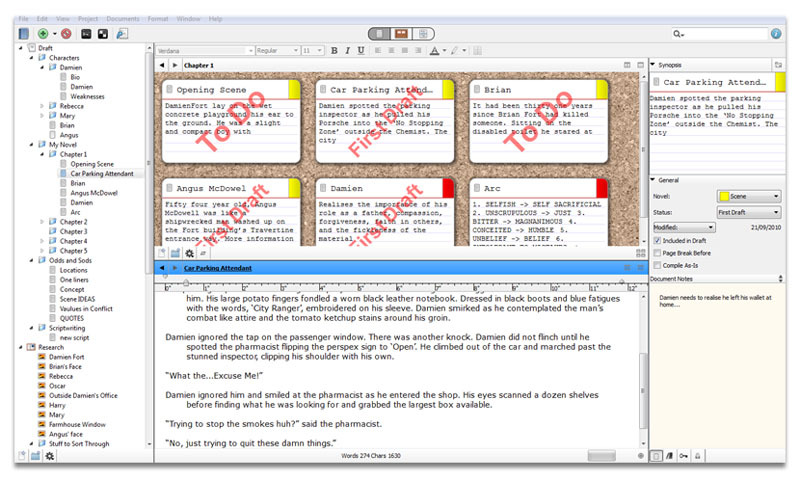 I like the looks of that Scrivener software…something that can create digital scenes, etc., sounds wonderful. It would take some practice using it, I'm sure, but how exciting! See you around on the site beginning tomorrow, and good luck! And yes, Blogger is enough to try the patience of a saint. I'm trying to amass the courage to switch to Word Press, but thus far have been overwhelmed by the prospect. Picture the Holidays sounds interesting… I'm going to take a look at the site. Good luck with NaNoWriMo! Love all those photography links, Molly. The e-course you are taking looks good. I might try it too. It must be so wonderful being able to share the NaNo energy with your students! You have so many things to comment on!! I love the 365 photo site and I'm sure you will find a lot of fun in participating in that. I've taken a few classes online at Big Picture (I scrapbook) and loved it. I'm sure you will too!Your teaching ideas are so awesome I'm going to send links to the Literature and Latte to some of my teachers who I know would love it. Christmas with Tucker sounds awesome actually!!! I too am amazed at how fast this year has flown by and that Thanksgiving is just around the corner!!! Blogger is such a pain! It's taking me longer than I thought to start up my self-hosted blog, but I will have one eventually. The camera class sounds like great fun! I also love the idea of the Tuck Everlasting games. And Scrivener sounds awesome! I haven't heard of it before, but then I haven't tried to write anything of length either. Good luck with everything this week! I'm not artsy, so I can get never take really nice photographs, but I love them. I really like the 365 day thing, but I don't know if I'd have the commitment to do it myself. I tried a week one once years ago and failed, so I doubt I'd manage it this time. Good luck with NaNoWriMo, to you and your students! Stupid Blogger. If I wasn't such a technology idiot and a big scared weeny, I'd move today. I don't even want to think about how many posts and comments I've lost. Stone age blogging I tell you. I love the idea of a picture a day. I may think about something like that when I run out of Wordless Wednesdays. Molly, I am loving your weekly Sunday Salon posts, so concise, yet so much info about your life. The photo a day idea sounds awesome, and I am a little jealous of the Christmas Book about the Tuck. Happy Hauntings and have a great week. Thank you for the links! I to love taking photos and would love to explore photography in depth. Good love with NaNoWriMo! Good luck with NaNoWriMo — something I have no interest in participating in but I think it is so great to have that community support. Yes on photography — it is way more than point and click. I've got my own NaNoWriMo going, thanks to Bethany House!! A teacher losing her voice, yikes! Good thing you haven't lost your great writer's voice!! I really enjoyed this post. It sounds like you have many good things happening. I have a friend who has participated in the 365 days photo project. It has been wonderful to see the pictures she posts. I think it is great how the kids are getting so into the writing thing! And I follow a few blogs that either do a photo a day or a week in review and they are fun to see … as well as a great record of what is going on in your life. love your classroom activities. i just gave a project to my 9th grade class–create a board game based on richard connell's 'the most dangerous game', which we've been reading in class. the games are due the monday before thanksgiving and we'll play them for the two classes leading up to the holiday! 🙂 i'm always delighted to see how creative my students are. I'd love to learn how to do more with my camera, so I'll be interested to see how your class goes. Good luck with NaNoWriMo! Like you I tend to look at photography more in terms of memory keeping, but lately I've been playing around with the manual settings and having a bit more fun with the camera. I do think it takes a special eye–one I don't have–but like you I'd also be interested in dabbling in photoshop. Sounds like you've got a great new project ahead of you! I don't really read holiday reads, though last year I did read Fannie Flagg's RedBird Christmas. It was cute. I hope you'll continue to share with us what jems you find! !